Tail meat can be enjoyed as is, returned to the shell or head as part of an elegant seafood platter, or as a feature in your favourite recipe. Always be careful of the spiny shells when handling. 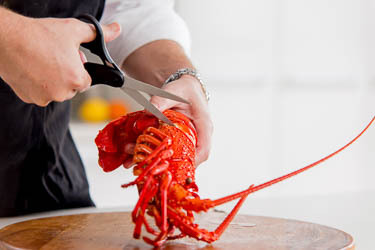 To remove the head, cut the seal on the neck of the lobster all the way around with the tip of a knife or kitchen scissors, which will allow for easy separation of the head from the tail. Hold the head and tail firmly in each hand and twist to remove the whole tail from the head. If you wish to use the tomalley you can now extract it from the head section. To remove the tail meat from the shell, hold the tail firmly facing upwards. 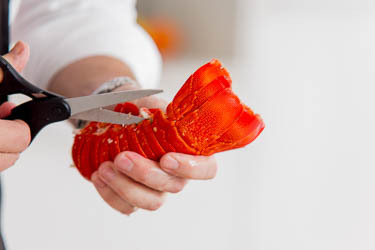 Using kitchen scissors, snip along both sides of the tail, cutting the hard shell as close as possible to where it joins the softer belly membrane. Gently remove the entire membrane section. 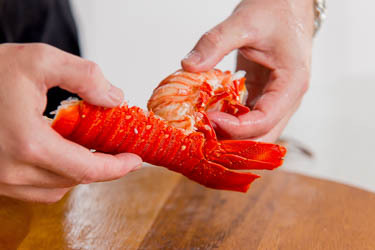 Gently remove the meat in one piece from the tail by prying the meat from the sides of the shell. Note that cooked tail meat is firmer and easier to remove in one piece compared to raw tail meat. 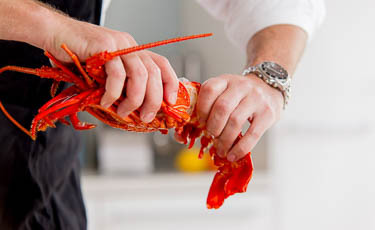 Note: Use immediately after preparing to avoid a natural and harmless discolouration of the lobster meat.